Purdue’s 1996-2002 marketing plans for OxyContin, which Kaiser Health News made public this year for the first time, offer an unprecedented look at how that company spent millions of dollars to push opioids for growing legions of pain sufferers. A wave of lawsuits demanding reimbursement and accountability for the opioid crisis now ravaging communities has heightened awareness about how and when drug makers realized the potential dangers of their products. The Purdue documents lay out how the company and its biggest competitors were jockeying for market share. Some of those drugmakers’ sales promotions downplayed or ignored the risks of taking opioids, or made false claims about their safety, federal regulators have asserted in warning letters to the companies. Purdue first offered OxyContin as a remedy for moderate to severe cancer pain in 1996. Within three years, the company viewed the cancer market as too limited, with $261 million in potential annual sales versus $1.3 billion for a broader range of chronic pain care, the company’s marketing reports said. 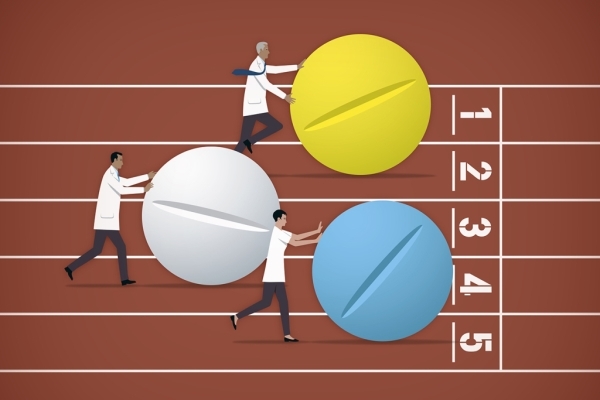 “That was a pretty good recipe for a blockbuster,” said Andrew Kolodny, who directs Physicians for Responsible Opioid Prescribing, an advocacy group critical of drug industry marketing. Purdue has become the most high-profile drugmaker linked to the surging opioid crisis. But other opioid manufacturers didn’t sit by idly as sales of OxyContin skyrocketed, topping $1 billion in 2000, despite reports of overdose deaths and addiction. Purdue’s marketing reports indicate the company was worried about losing business to fentanyl-laced patches called Duragesic, as well as morphine pills and, to a lesser degree, methadone — which some managed-care groups and Medicaid health plans preferred because it cost much less than OxyContin. Methadone and morphine are made by a variety of drug companies. In its 1999 marketing report, Purdue noted that Janssen Pharmaceuticals, an arm of drug giant Johnson & Johnson, was making “slow but steady” progress in promoting its Duragesic patches. The patches, which users attach to their skin, deliver a dose of fentanyl, an opioid drug about 50 to 100 times more powerful than morphine, according to the Drug Enforcement Administration. Purdue estimated that Janssen would spend about $4 million in 1999 on medical journal advertising to persuade doctors to prescribe the patches for “early treatment of non-cancer pain and pain in the more frail elderly.” That is more than triple what Janssen spent the year before, according to the 2000 Purdue marketing report. In a statement to KHN, a Janssen spokesman said the company quit “actively marketing” Duragesic in 2008. Purdue also spent millions on medical journal ads — and like Janssen, it drew criticism from the Food and Drug Administration for minimizing the dangers of opioids, government records show. In 2000, the Food and Drug Administration criticized Purdue for exaggerating the benefits of using OxyContin to treat arthritis, while in 2003 the agency found that some other ads had “grossly overstated” OxyContin’s safety. The Purdue marketing reports are part of a cache of documents the company provided to the Florida attorney general’s office in 2002. The Florida attorney general released them to two Florida newspapers in 2003 after Purdue lost a court battle to keep them under wraps. The growing cluster of lawsuits argue that drugmakers set out to deceive doctors and the public by claiming their products presented little risk. For its part, Purdue accused Janssen of trying to exploit public alarm over OxyContin-linked deaths to spark new sales of Duragesic. “It has been reported that Janssen sales representatives are using improper techniques to capitalize on the negative press surrounding OxyContin Tablets and the issue of abuse and diversion,” reads the 2002 Purdue marketing plan. In fact, opioids made by Purdue’s rivals also contributed to overdose deaths in those years and have continued to do so. In 2016, more than 42,000 people died nationwide from opioid-related causes, according to the Department of Health and Human Services. Florida was one of the early states to see a rise in overdose deaths tied to prescription drugs. Florida medical examiner’s toxicology reports in 2002 detected oxycodone, the active ingredient in OxyContin, in hundreds of overdose fatalities. Abusers realized they could crush the pills and inject or snort the powder to get high. Many others died after mixing the pills with sedatives also prescribed by their doctors. Florida medical examiner files also showed that abuse of fentanyl pain patches, methadone and morphine took many lives. Some abusers had figured out how to drain the Duragesic patch of its liquid fentanyl and inject it like heroin, or otherwise ingest it. Purdue also kept an eye on methadone, noting in a 1999 marketing plan that “market research as well as reports from the sales force indicates that methadone use is increasing in both the management of cancer pain and non-malignant pain due to its low cost.” But as methadone won acceptance for treating pain, it also began to kill with alarming frequency.